Studied Culinary Arts and Administration at the Centro Culinario de México (Ambrosía). In 2004, he set sail with Princess Cruises and worked on voyages around the world. 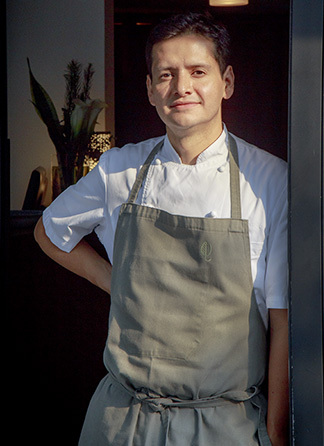 Back on land in Mexico, he joined the team at Pujol and then served as Corporate Chef at Grupo Habita, where he oversaw kitchens at the Hotel Condesa DF, Hotel Habita and Hotel Distrito Capital. In 2010, he became Executive Chef at Restaurante Diana at Mexico City’s St. Regis Hotel, a position he left for a stint at René Redzepi’s famed Copenhagen restaurant, Noma. Vallejo and his wife Alejandra Flores opened Quintonil restaurant in 2012. In 2014, alongside Chefs Mauro Colagreco (Mirazur; Menton, France) and Virgilio Martínez (Restaurante Central, Lima), Vallejo launched the initiative known as Orígenes, to re-encounter and preserve culinary products, techniques and customs that survive in small Latin American communities. Since then, the chefs have journeyed to small towns throughout the Americas to research customs and share experiences and teachings with local populations. In 2016, Chef Jorge Vallejo designed the culinary offer of Hotel Chablé in Yucatan, which he based on organic and seasonal cuisine. In September 2017, Chef Vallejo created a menu for the restaurant Hangar 7, in Salzburg, Austria, which was served throughout that month. Vallejo has been the recipient of numerous prizes and recognitions. He was named one of the world’s “Rising Stars” (FOUR Magazine, 2014); Chef of the Year (GQ Hombres del Año awards, 2015) and got the Premio Millesime México al Mejor Restaurante in 2015. Quién magazine included him among its list of personalities that are transforming Mexico (2015). In 2016 he was added to the list of Mexico’s 300 most influential leaders. 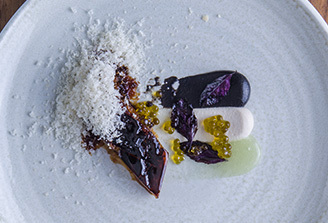 Quintonil made debut on British Restaurant magazine’s “World’s Fifty Best Restaurants” list at number 35 in 2015 and bumped up to 11th place in 2018, making it the list’s highest-ranking Mexican restaurant to date. 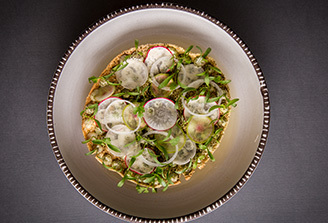 Quintonil presents an approach that expresses the flavors and techniques of contemporary Mexican cooking—honest, striking and free from static. It’s a restaurant platform that perfectly blends the kitchen- service dynamic. And a modern vision when it comes to Mexican cuisine and profound sustainability standards. 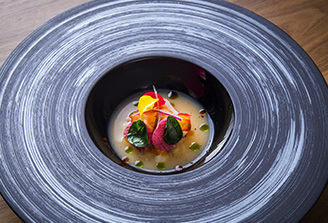 Quintonil’s gastronomic offerings center on the study and expression of Mexico’s rich ingredient variety in dishes, sauces and other preparations. Each ingredient Quintonil uses is chosen with knowledge of its provenance, method of cultivation, and most relevant features, as a way to harness its maximum potential. It’s our unwavering commitment to quality standards as we support true sustainability in partnership with producers, providers and farming communities. 2016　Quién　Mexico’s 300 most influential leaders.